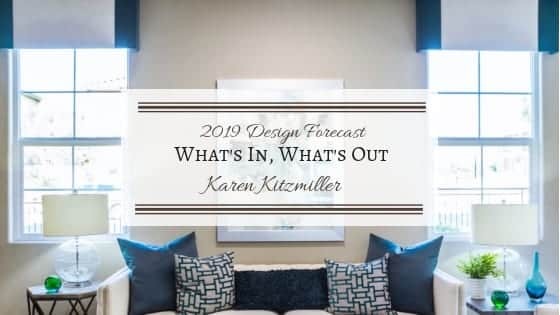 As we begin a new year, it’s time to look at interior design trends on the rise — and say goodbye to those on their way out in 2019. It’s official — many regions throughout the U.S. are choosing a modern aesthetic over a rustic style. While black-and-white contrast and raw materials like steel and wood will continue to be popular, they’ll be softened by color and asymmetry. These modern elements will have a fresh approachability when surrounded by sun-soaked fabrics and natural wallcoverings. Talk-to-me tech products help you get things done with your voice, and homeowners are using them to modernize their daily routine. In 2019 you’ll see smart faucets, fans, window coverings and appliances paired with popular platforms — Google Home, Amazon Alexa and Apple HomePod — for a convenient, connected home. Additionally, products that offer easy installation and seamless integration into existing layouts make projects remodel-friendly. Innovative sinks, faucets, medicine cabinets, appliances and lighting provide a quick transformation to refresh the style and functionality of your space. Though talk-to-me tech is trending, some will be looking for ways to escape the chatter. Meditative and sound-barrier features will appear in more homes this year — think transformative experiences using acoustic panels, colored lights and aura effects. Ethereal, sheer and translucent fabrics will support the aesthetic, pairing an organic feel with the benefits and convenience of select technology. Concrete, quartz and metal lovers, rejoice! Industrial styles are predicted to rise in popularity in 2019. Matte black and bronze continue to dominate and complement a more industrial vibe. But when selecting wall colors, appliances, faucet finishes and fabrics, consider the possibilities of moody blues and the gray color spectrum. From warm light grays to the coolness of matte black, these tones add a subtle layer of intrigue and distinction. Plus, black and charcoal gray front doors could earn up to $6,271 more when selling your home! Handmade details can immediately soften an interior. This year you’ll see rhythmic patterns and imperfect lines incorporated through hand-painting, stitching and detailing, expanding the possibilities for endless mixing and matching in the home. Additionally, fabrics and accents with strands of crystal, wooden and pearlescent beads present a sophisticated flair for artful detail. Home decor favorites will still include earthy elements and nubby textures. Think neutral naturals by simply adding a wooden side table and sculpture, live and fake plants for color, and natural fibers through rugs and fabrics. Is America finally over the “Fixer Upper” movement? Not quite, but the rustic, farmhouse-chic elements are getting refined. The shiplap-crazy trend seems to be leaning toward a modern twist, simplifying layers of the look. Cutesy barn doors will take a backseat to more modern versions featuring glass and metal instead of reclaimed barn wood. The signature statement range hood covered in rustic materials will swing to simplified finishes, like brushed brass, stainless and matte black. Lastly, the harsh light of the Edison bulb will move to a more complementary glow, reflecting concealed bulbs versus exposed ones. Bold, trendy color schemes are likely on the way out, with more subtle earth tones and cool, classic palettes on the rise. Blues and neutrals continue to top Zillow trend reports, adding higher dollar values related to home sales when used in kitchen and bathroom areas. While millennial pink may have been all the rage on designer Instagram feeds, people don’t actually want to live with it throughout their homes. Whether trends inspire you or not, it’s important to be aware of them, because they help shape our own personal interior style. If you love purple gingham in your dining room, go for it. If an all-white interior speaks to you, celebrate it. Our homes are where we express ourselves and tell our unique style story, so I encourage you to do just that in the new year.